Dynamic buffer data refers to frequently updated data stored in a buffer. To avoid creating new buffers per frame and to minimize processor idle time between frames, implement a triple buffering model. Dynamic buffer data is typically written by the CPU and read by the GPU. An access conflict occurs if these operations happen at the same time; the CPU must finish writing the data before the GPU can read it, and the GPU must finish reading that data before the CPU can overwrite it. If dynamic buffer data is stored in a single buffer, this causes extended periods of processor idle time when either the CPU is stalled or the GPU is starved. For the processors to work in parallel, the CPU should be working at least one frame ahead of the GPU. 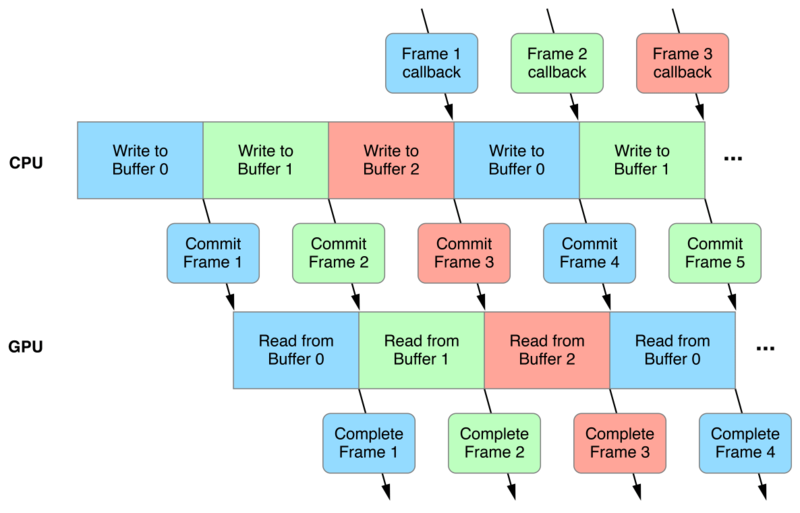 This solution requires multiple instances of dynamic buffer data, so the CPU can write the data for frame n+1 while the GPU reads the data for frame n.
You can manage multiple instances of dynamic buffer data with a FIFO queue of reusable buffers. However, allocating too many buffers increases memory overhead and may limit memory allocation for other resources. Additionally, allocating too many buffers increases frame latency if the CPU work is too far ahead of the GPU work. Avoid creating new buffers per frame. For an overview of allocating resource storage up front, see the Persistent Objects best practices. The CPU writes to the dynamic data buffer and encodes commands into a command buffer. The CPU schedules a completion handler (addCompletedHandler:), commits the command buffer (commit), and transfers the command buffer to the GPU. The GPU executes the command buffer and reads from the dynamic data buffer. The GPU completes its execution and calls the command buffer completion handler (MTLCommandBufferHandler). This sequence can be parallelized with two dynamic data buffers, but the command buffer transactions may cause the CPU to stall or the GPU to starve if either processor is waiting on a busy dynamic data buffer. Adding a third dynamic data buffer is the ideal solution when considering processor idle time, memory overhead, and frame latency. Figure 4-1 shows a triple buffering timeline, and Listing 4-1 shows a triple buffering implementation. // Create a semaphore that gets signaled at each frame boundary.